Arrive Calcutta / Delhi. Half Day Sightseeing of the city. Overnight at Hotel. Leave Calcutta / Delhi for Patna by air. Drive to Bodhgaya where the Buddha attained enlightenment and which is one of the most sacred pilgrimage places for the Buddhist. Enroute visit Nalanda and Rajgir. Nalanda - a great center of Buddhist learning and one of the most famed university citadels of ancient tims. Rajgir - it was once the ancient capital of the powerful kingdom of Maghada. From the out skirts of Rajgir, a historic road leads to Gridha - Kuta or vultures peak where the Buddha preached, here the first Buddhist Council was held after the Lord's Mahaparinirvana. Sightseeing of Bodhgaya including Mahaparinirvana Temple, Bodhi Tree and various temples. Overnight in Bodhgaya. Early morning boat ride on the River Ganges to see the sun rise and the bathing ghats of an ancient Hindu city. Later, leave Varanasi for Kushinagar.Overnight in Kushinagar. Leave Kushinagar for Lumbinin by surface. Sightseeing of Lumbini where the Lord was born. Emperor Ashok, in the twenty first year after his coronotion, visited the birthplace and raised a pillar on the spot. Later proceed to Balrampur. Leave Balrampur for Lucknow enroute visit Sravasti (Sahet-Mahet) capital of the ancient kingdom of Kosala, an active centre for Buddhism. Overnight in Lucknow. Leave Lucknow for Delhi by air. Half day sightseeing of Old and New Delhi visiting Red Fort, Jama Masjid, Qutab Minar and the Secretarial Buildings. Overnight in Delhi. 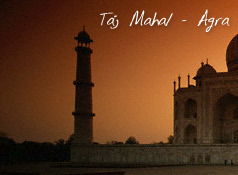 Full day excursion to Agra, city of the Taj Mahal. 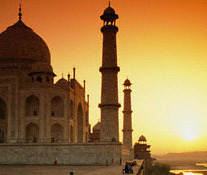 Also visit Agra Fort and Sikandra, Overnight in Delhi. Day at leisure in Delhi.